The biggest factor in staying organized, is having less stuff. Fewer items, means fewer things to keep organized. Which is why consistently decluttering each week is so important. Decluttering doesn’t have to be an all-day or even an hour-long event. A little each day goes a long way. These are the 7 Spaces in Your Home You Should Be Decluttering Daily. 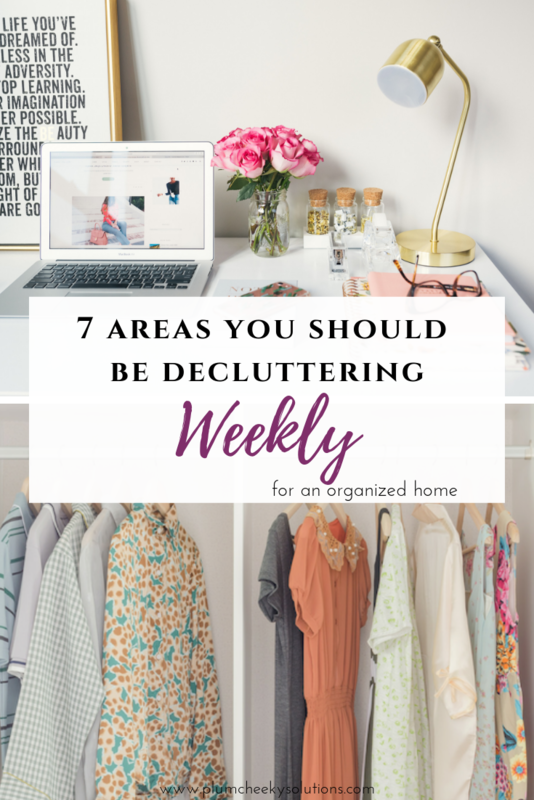 Along with the daily decluttering, there are 7 areas you should be decluttering weekly as well. I know it can sound overwhelming, but they really won’t take you that long and you can easily add them to your routine as you go throughout your week. Keeping things decluttered on a daily and weekly basis, will mean less time and effort when you want to organize and it’ll keep your home continually looking tidy and organized. Having a cluttered work area is stressful. Not only is it hard to work around the mess, but it can be hard to find what you’re looking for, if it’s buried under stuff. Take a few minutes each week to tackle your home office/desk/work area to help you be more productive with your time. Start by removing any items that don’t belong in that room or garbage and put them away or in the trash. Once those are removed, put items away that DO belong in the office, but are not where they need to be. The best way to keep this area tidy, is to declutter and put things back on a weekly basis. The fridge is where leftovers go to die. It gets cluttered with expired food items, uneaten leftovers and mostly empty bottle of condiments that have already been replaced, yet we hold onto the bottle “just in case we might use that last tablespoon of ketchup”. Am I right? When these things accumulate they make the fridge look cluttered and take up valuable space. Take a few minutes each week (before you go grocery shopping is best) to go through your old leftovers, expired items and empty bottles, and toss them. Take a damp cloth (I use hot, soapy water) and wipe down the shelves and any surface spills or sticky spots. This will cut down on any questionable items being left in your refrigerator for an extended period of time and free up some space for the new groceries. The bathroom is used multiple times on a daily basis and usually by multiple people. If we are decluttering our countertops on a daily basis that is a huge help to keeping the bathroom looking tidy, however it doesn’t end there. The cabinets, drawer and any closets in that room often get to be a cluttered mess as we’re going in and out of them. Putting things away in them, also contributes to the growing mess, when we’re not taking the time to remove items that we no longer need or use. We can’t keep filling up the space without removing items otherwise we’ll run out of space and it makes it difficult to go into that space without causing an avalanche. So, to keep your bathroom decluttered take a few minutes each week to remove and discard items that are no longer needed or empty and straighten things up. With nightstands being a flat surface they practically beg to be cluttered. A glass of water, a book, journal, hand lotion, pens, alarm clock, a box of Kleenex, hair ties…am I missing anything? If we are constantly putting things on our nightstands we need to also make sure we are putting items away where they belong to keep it tidy. Remove garbage and anything else that doesn’t belong and put them away. For the items that you want to keep tidy looking, use a basket to coral it all. You don’t have to do a complete overhaul on your closet each week to keep it tidy. Who has time for that!? Instead, go thru your closet once a week and make sure to fold and hang anything that is not put away. For items that you don’t use or like anymore, store a donate bag or basket at the bottom of your closet to put them into as you come across them. Just putting clothing where it belongs and removing items that are cluttering up your closet are a huge help to keeping your closet clutter free. Wrappers, receipts, random pieces of Lego, library books, half eaten apples, coffee cups…sound familiar? To keep the clutter under control in your vehicle, go thru your vehicle and declutter once a week. Next time you use your vehicle, grab a tote and a plastic bag. Pick up all the garbage (not while you’re driving) and place in the trash bag. Put any items that need to go back in the house into the tote. Doing this weekly will keep your vehicle neat and tidy. A couple minutes a week goes a long way. Paper clutter is an area that needs to be dealt with on a daily and weekly basis. When we deal with the paper and mail coming into the house each day by quickly sorting it into it’s appropriate file (school papers, to pay, to file or recycle) that keeps everything looking tidy, but we still need to deal with each file. This is when we deal with the “to do later” or “to pay” files from our daily decluttering of paper. That means paying the bills and then recycling or filing it, signing the form, filing the receipt or whatever else needs to be done. Dealing with our paper on a daily and weekly basis makes the task of keeping paper in order way less overwhelming. What do you struggle with to maintain and keep your home decluttered?